The Holidays bring wonderment for all of our senses, especially our sense of smell. What scents remind you of the season for giving and thankfulness? For me the scents are ones that remind me of visiting my grandparents. We used to visit for Thanksgiving and on occasion Christmas. The scents would be of cookies baking, spice scented foods, fruits being turned into pies. Grandma always had a wonderful smelling kitchen and so much of it was natural. She spent hours and hours preparing her deluxe setup of cookies and treats for all of her holiday visitors. We live several states away now, and my own children haven't had the opportunity to experience what I did growing up,with the all of the scents and beauty of celebrating with family. 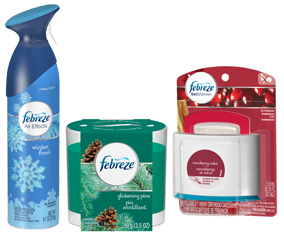 Febreze Holiday scents help give this mom a hand up in setting the mood for the holidays. I love the new Cranberry Cider scent from Febreze. It is not overbearing, yet gives the scent of fresh cranberries and Cider mixed together. I plugged the Febreze NOTICEables right next to the front door of the house. As soon as you walk in the house you get a beautiful scent! It so reminds me of Grandma's house and the holiday. I have yet to start baking, and I highly doubt I will come anywhere close to the greatness Grandma pulled off. Febreze is giving me a head start though and I love it! The Febreze Set and Refresh doesn't require electricity, making it perfect for those hard to reach places and in the bathroom. I have long enjoyed Febreze products, and this just adds to the already great line up that they have. Cranberry Cider is a scent we will use often. Febreze also has a fabric refresher in this scent. Love it! What are your favorite holiday scents? Do you enjoy the turkey and ham smells? What about apple and pumpkin pie? What ever your tastes, you will enjoy these refreshing, clean smells from Febreze. Let Febreze bring Scent-sational memories to your home this fall! I like pumpkin spice but I like cinnamon too. I do not like pine but thats probably because I am allergic to pine trees so it brings up bad memories. my favorite scent is a live christmas tree. I'm weird- I like pine, but I really like the smell of spice in the air around Christmas=mulberry, etc. I love the spices....cinnamon is a great fragrance to have. My favorite holiday scent is Bayberry or balsam scented candles or room sprays. I like fresh apple pie. I like gingerbread and cinnamon scents. I always like cinnamon scents. My fave would be turkey dinner if they made that scent. I love the scent of cloves and cinnamon and I also like the smell of pine. I like the scent of evergreens. Can't beat the smell of a real Christmas tree. I really like sugar cookie or vanilla for Christmas and then I like pumpkin spice and salted caramel for Thanksgiving! I like pumpkin, spicy, and baking scents for the holidays. I like apples and cinnamon! Pumpkin Spice is my favorite.